Along with servicing the entire Phoenix area, Green Planet Carpet Care is the best carpet cleaning service for Scottsdale and especially North Scottsdale, Arizona. We know our customers take pride in their homes and neighborhoods, and so do we. Unlike many of our competitors that arrive at your home in older run down equipment that looks like a Sanford and Son re-run, Green Planet Carpet Care arrives in a new state-of-the-art Vortex 7000 cleaning system - the industry's biggest and most powerful carpet cleaning machine! Green Planet Carpet Care knows that you appreciate the best equipment being used to steam clean your carpets, tile, and upholstery. When Green Planet Carpet Care shows up for your carpet cleaning in Scottsdale, we are noticed! We normally receive comments like "that's professional", or "wow, you're not the average cleaner". That is because we know that any service company is judged by the presence they make upon arrival. Scottsdale and Paradise Valley are no exception. With our Scottsdale carpet cleaning service, you can trust our equipment and reputation, we will not disappoint you. Follow this link "How We Professionally Clean Your Carpets" for more information. 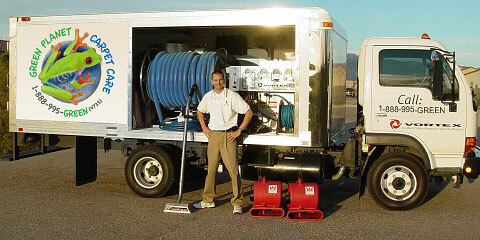 The Owner, Bryan Phillips, with our powerful carpet cleaning truck. 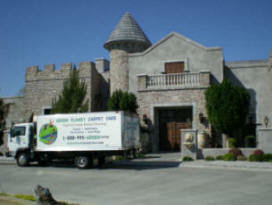 Green Planet Carpet Care is not like the low cost Scottsdale carpet cleaning companies. We will not quote you a bargain basement price over the telephone then when we arrive at your home and ask you if you want pre-spray or other items to increase the cost. These are bait and switch tactics which is not our way of doing business. Pre-spray is always required to clean your carpets properly and we use an eco-friendly pre-spray which is included in any price we quote. There are no hidden costs for pre spotting or vacuuming. Our carpet cleaning Scottsdale service is simply the best. We would like the opportunity to show you what we can do to help improve your home environment.